The hand forage cards dealt this year could use some face cards. Weather issues this year certainly impacted forage growth. A snowstorm in April hit the Midwest pretty hard. On the flip side, drought struck areas of Missouri and Illinois. The dangerous hurricanes dumped huge amounts of water in the Southeast, wreaking havoc on fields. The Upper Midwest also saw heavy rains, leading to flooding and down corn. The wildfires out West delayed hay drying by four to five days. These acts of nature put many farmers into damage control mode to minimize losses. With a lower selling price of corn, many farmers plan to sit on their corn supply this fall, using it for their own feed or waiting for a more advantageous price to sell. On a positive note, fuzzy cottonseed finally looks to be price-friendly. Soybean meal and shelled corn also are more affordable. If available, Hutjens urged listeners to consider locking in prices on these feedstuffs. During the live presentation, viewers were asked how their feed program would be changing this year. (They could vote for more than one option.) Over half voted that they would be feeding more corn silage and one-third would be feeding more corn grain. An additional third would be feeding more legume/grass forage. Just over 10 percent would be taking advantage of the cheaper cottonseed prices and feeding it, while 8 percent plan to feed soybean seed as an oil/fat source. There was not as much dry hay around this year. Supplies were at one of the three lowest points since 2000. One reason is that forages were fed into late spring due to cold, wet weather. The states of Texas, Missouri, and California all had inventory reductions above 58 percent. Wisconsin was also hard hit, dropping inventories 41 percent. California continues to lessen the amount of dry hay in milking cow rations. Dairies in that state are now feeding about 7 pounds of dry matter per Holstein cow. The price paid for high-quality hay has been significantly higher than last year. Lower-quality alfalfa hay prices have been exceptionally strong, as well. For 2018, USDA predicts alfalfa acreage to rise 5 percent. But purchases from the U.S.’s biggest export market, China, are off 19 percent so far this year due to trade issues, including the 25 percent tariff placed on U.S. alfalfa hay. Saudi Arabia continues to be a growing alfalfa market because of the restricted distribution of water to their country’s alfalfa fields. That country is purchasing land in the U.S. and other countries, growing alfalfa, and subsequently shipping the dry hay to their home country for dairy cow feed. Looking at 2018 corn silage, feed reports show lower starch levels in Western silage as compared to the Midwest and Northeast. Drought conditions in Missouri and Arizona, also caused lower starch content in those states’ corn silage. Starch content in the Midwest and East looks to be better than the past two years. Hutjens suggested purchasing corn silage on a dry matter basis to achieve a more accurate price for your feed value. And with both drought and excess water, depending on the region, buyers should be on the lookout for mycotoxins in purchased feed. He also reminded producers that some mycotoxins are excreted in the milk and will appear in bulk milk tank samples. This is regulated by the Food and Drug Administration (FDA). Mycotoxin binders should be considered. Also, for silage to be at its best, it needs to properly ferment. Are particles chopped the appropriate length for storage? Was an inoculant used? Was the silage packed well and protected from the elements? All of these management steps deserve attention as they directly impact feed quality and nutritive value. 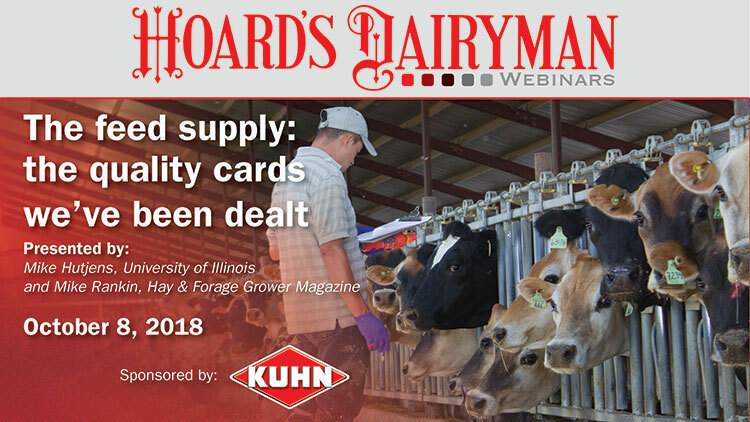 The webinar was sponsored by Kuhn. The archive of the webinar can be found here. Larry Tranel, Iowa State University Extension and Outreach, presents “Economics and user experiences with automatic milking” on Monday, November 12, at noon (Central time). Automatic milking systems (AMS) continue to expand and user experience is growing. The webinar will focus on surveys and Tranel’s experiences working with producers who utilize robots, and it will cover economic variables that may help determine profitability and cash flow. The webinar is sponsored by Cargill Animal Nutrition.